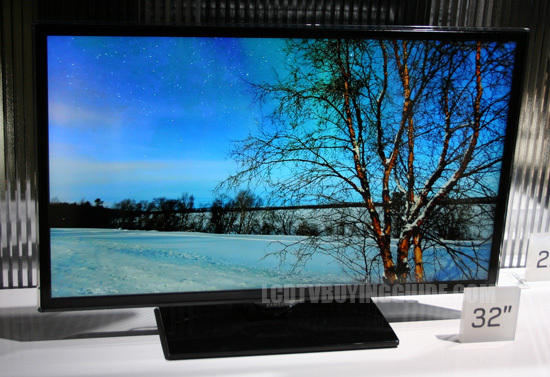 This smaller size line of LED backlit LCD Televisions begins circulation in North America in March or April of 2012. The 26EH4000 has all the same features as the ES5000 series - just in smaller sizes with a super thin .4" black bezel frame and 60Hz processing. The EH4000 series televisions offer LED edge lighting in small sizes. Though it does not have some of the higher end features such as 240Hz processing or Micro dimming technology you will be impressed by the picture quality on this smaller LED Television just like we are. Viewing quality is enhanced by the strong LED backlights and light throughput that they afford. Areas of the screen where content sunlight hits a picture background or image will be striking as the clear coat screen makes the picture come alive. Colors are not as saturated as plasma or some other LED manufacturers screens. The backlight can wash them out so we recommend a moderated backlight setting which can be found in the picture controls menu. All in all, you will not need a higher Hz rate or premium viewing features on this small of a TV. It would be incredibly difficult to notice the improvement due to the 32" size screen. For an edge lit LED television the side angle viewing performance on the 26EH4000 is pretty good, contrast begins to fade around 30 degrees which is a good result for an edge lit LED television. Black performance on the EH4000 is a strong point, blacks are dark and inky and show improvement over 2011 models. The largest improvment is in detail in dark scenes, an area where the black could be over powering in previous models.